The EOS 750D is more of a straight replacement of the EOS 700D in terms of the physical design of the camera and what you can do with it. It’s billed as being a more automatic camera, rather than one for a serious enthusiast who wants to take complete control of the exposure. For enthusiasts, Canon has added the EOS 760D. The EOS 760D has more physical controls that allow for quicker, on-the-fly changes to be made to the exposure. Apart from the index finger control at the top of the camera, there is a thumb dial on the rear so that both aperture and exposure can be changed without fiddling with intermediary buttons. The main mode control has been placed on the left, leaving room for a settings window on the right side. There is no doubt that if you want to be able to set exposure yourself, and to do it quickly rather than fiddling with numerous buttons, the EOS 760D is the camera you’ll want to consider. The EOS 750D is more for an inexperienced user just getting into the swing of digital SLR photography, and who doesn’t want to be bamboozled immediately by a glut of controls. In terms of specs, the two cameras feature a 24-megapixel sensor, 19-point autofocus, five frames per second continues shooting, and an ISO range from 100-12800. You also get Wi-Fi and NFC. A Digic 6 processor is installed to facilitate those features and crunch the images. Another feature Canon is touting is Flicker Detection technology, which is said to provide consistent exposures even when shooting with artificial light. Both cameras are suited to movie-making, with the cameras capable of capturing Full HD MP4 files. Focusing features for movies include tracking and swapping, and Canon says the whole process will be a lot faster and smoother when using its STM lenses. Creative shooting modes for video include HDR, and a miniature effect. 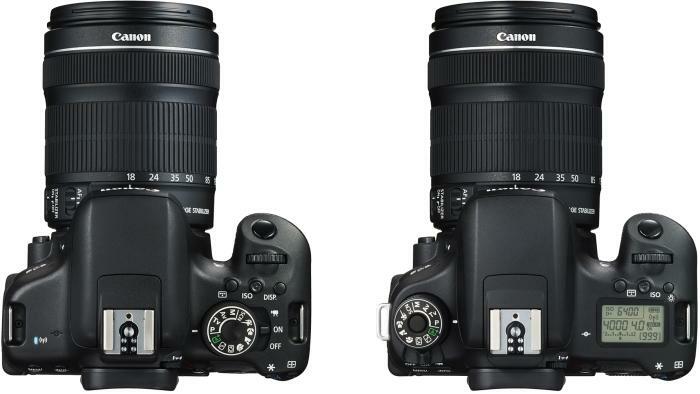 Both the EOS 750D and 760D will be available from April 2015.